The alleged shooters have since been arrested though at the time of this writing their identities are not public. But Robinson is still dead. And he's dead because some people have such outrageously sensitive egos that anyone who insults them is apparently worthy of the ultimate sanction. That's insane. But apparently there's a lot of insanity going around. We've discussed the ongoing cultural war over the Confederate Battle Flag. When I see someone who wraps themselves in that flag I pretty much know where I stand with them. I do think that they have every right under the First Amendment to make asinine arguments about how they aren't really white supremacists or to wear their loser's flag or to put it on their pickup bumper or to fly it from the highest point on their house. What they don't have the right to do is to put into action the thoughts that flag obviously signals. Two particularly pathetic and dangerous Confederate flag supporters recently discovered that the law really does make a distinction between words and thoughts on the one hand and actions on the other. A Georgia couple who rode with a Confederate flag-waving group that made armed threats against African-Americans at a child's birthday party were sentenced to prison Monday. Jose "Joe" Torres, was sentenced to 20 years, with 13 years in prison, after a jury convicted him on three counts of aggravated assault, one count of making terroristic threats and one count of violating of Georgia's Street Gang Terrorism and Prevention Act. Kayla Norton was sentenced to 15 years, with six years in prison. She was convicted on one count of making terroristic threats and one count of violation of the Street Gang Act. "Many people tried to make the case about simply flying the Confederate Battle Flag," Douglas County District Attorney Brian Fortner said in a statement. "This case was about a group of people riding around our community, drinking alcohol, harassing and intimidating our citizens because of the color of their skin." "The convoy of trucks passed by the victim's residence where the victims were grilling hot dogs and hamburgers while hosting a child's birthday party featuring a bouncy castle, snow-cone machines, and a DJ," the district attorney's office posted on its official Facebook page. The drivers parked the trucks near the house, prosecutors said. Torres was part of a smaller group that "threatened to kill the party goers while repeatedly using derogatory racial slurs against them," said the statement. "Torres, who had retrieved a shotgun from his vehicle, pointed his shotgun at the group of African American party-goers and stated he was going to kill them while his co-defendants (Norton) stated that 'the little ones can get one too,' referring to the young children at the party," the statement said. Video of Monday's sentencing shot by WSB-TV, a CNN affiliate, showed both Torres and Norton breaking down in court as Judge William McClain handed down the sentence. I think that Torres and Norton put on a pretty good show of pretending to be sorry for their actions. I think that they are only sorry they got caught. 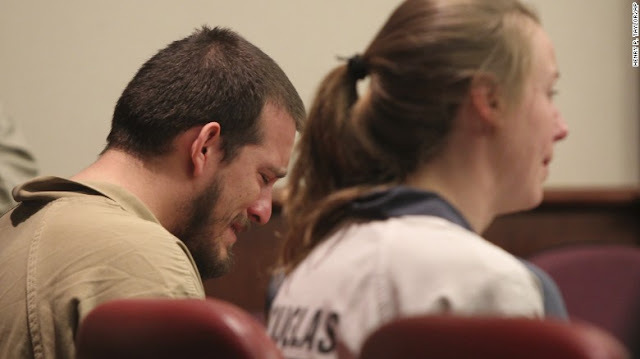 I would bet good money that those tears stopped abruptly as soon as they were out of court. I can't imagine someone pointing a gun at me and mine and threatening to kill us and later having the sheer unmitigated audacity to look at me and sob that that's not who they are. No. That is exactly who you are. And that is what the Civil War and the next hundred years after the Civil War was all about. White supremacy up to and including murder. What sort of sickos attack a child's birthday party? White supremacists, that's who. In prison, Torres and Norton will no doubt rise up the ranks of white supremacist gangs. When they are released is the time to watch them. Because the next time they have some black people in front of their guns, those black people may not survive.